Drywall Ceiling Repair In Calabasas, CA - No More Cracks Or Holes! Get Rid Of Ceiling Cracks! While the drywall of your home’s ceilings is much sturdier than that of your walls, you still may find yourself with some damage to it over time. Whether from an accident, water damage, or cracking due to settling, this harm will pull eyes away from the beautiful look of your home and leave it looking shabby. This damage can also worsen over time if left alone, and may even by dangerous if pieces begin to fall, which is by its best to let the professionals fix it for you. This type of drywall can be more complicated to repair than walls as well, so trust the experts to handle it! 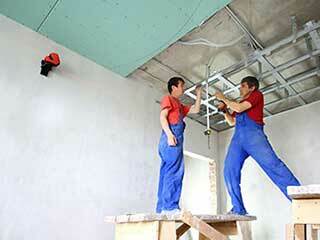 Our experts would be glad to assist you with any repairs to your home’s smooth ceilings right away! We’ll begin by checking to ensure that there aren’t any pipes, wires, or studs in the affected area to work around, as well as inspecting to determine how far the damage extends. After cutting out and removing the area with the damage, as well as potentially moving insulation that might fall as we work, we’ll saw the new piece of drywall to the correct fit. It will be attached using drywall screws after replacing any insulation if necessary. Special drywall compound and tape is used to secure it into place and erase any lines, and once that’s dry it can be primed and painted. Textured ceilings require an extra step to be completed, but we’re more than happy to take care of it for you and get your ceilings looking as if nothing happened! We’ll first scrape off all the textured paint on the ceiling before we start to avoid any mismatched areas. Then, after we’re finished with repairs and priming, we’ll use a textured-sleeve roller to recreate the look your ceiling had. Whatever repairs or remodeling needs or ideas you have about your ceiling, be it at your office of home, we’re the team for the job. Give us a call today or schedule your appointment online today!